Holiday dinners, holiday parties, intimate gatherings with family and friends — cooking is key, but you have to decorate too. You could buy the obligatory bunch of grocery store flowers and stick them in the vase that those roses came in last Valentine’s Day, or you could exercise a little thought and creativity and come up with a simple centerpiece on a budget. Keep it low. The last thing you want at a dinner party is to discourage conversation by plopping a giant arrangement in the middle of the table! Let your guests see each others’ smiling faces! Forget the flowers. Flowers can be great, but they’re also a little expected. There are all sorts of other interesting items you can use in an arrangement. See below for some ideas. Move away from the mixed bouquets. If you do use flowers, avoid those bouquets of 10 different types. Either they cost a fortune or they scream “grocery store!” Stick to one or two types of flowers with interesting colors and textures. Go crazy with your container. There’s a place for a simple glass vase, but other containers can also lend some pizzazz to a plain arrangement. 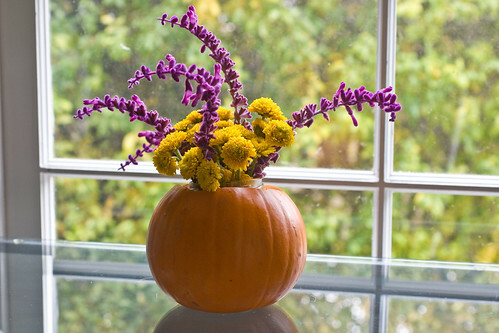 A hollowed pumpkin makes a great vase that lends any arrangement a seasonal air. Here, I combined tiny yellow mums (from the grocery store) with purple Mexican sage (which is taking over my garden). These are combined in a glass jar that’s placed inside a hollowed-out pie pumpkin. Seasonal fruits are beautiful and always appetizing on a table. 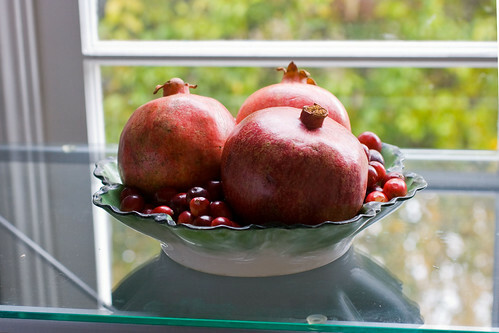 Here I’ve arranged a few pomegranates — one of my favorite, striking fruits — on a bed of cranberries, with their deep red shine. To give this an extra holiday flair, I’ve used a green dish. I always think chestnuts are beautiful and seasonal, and I want to buy them but I don’t want to peel them. Using them for decoration solves this problem. 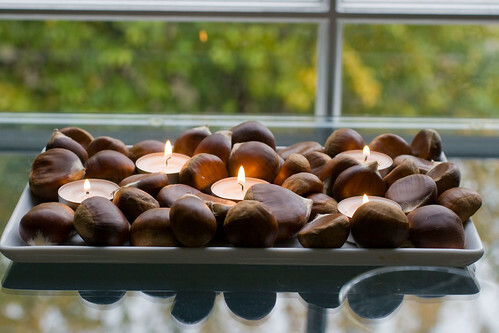 Here, I’ve arranged several chestnuts on a low white tray and placed tealights among them. 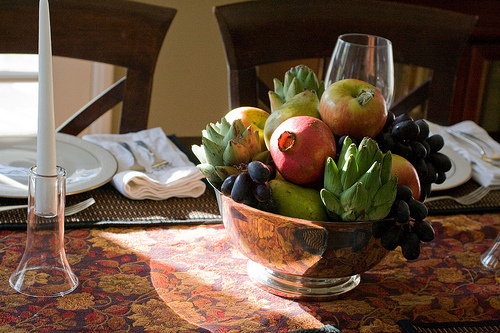 A large bowl of fruit is beautiful and seasonal, and guests may be tempted to help themselves after dinner is finished! I always associate clementines and their scent with the Christmas holidays, and the bright color is welcome on a dark day. 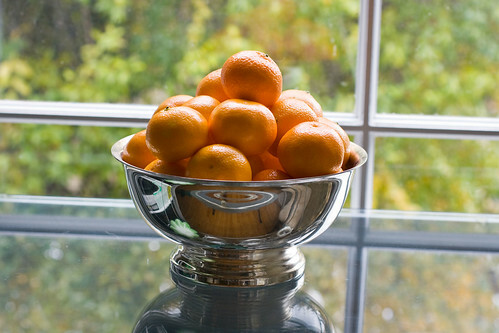 I think a simple silver bowl sets off the shining orange beautifully. Most arrangements have all the color up top in a rather plain container. 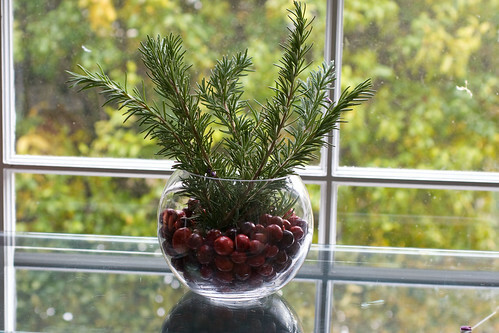 Placing cranberries in a glass vase and arranging greens in the berries (here, sprigs of rosemary, which offer a lovely piney scent and also grow like a weed in my garden) inverts expectations and provides holiday colors and fragrance. All of these took less than five minutes to put together, and would add to any holiday table. What are your favorite holiday centerpieces? Love that you address the height of a centerpiece – why do so many folks forget about this?